Home » Uncategorized » All That Heat…. Chances are pretty good that you have not been obsessively tracking the profound amount of heat that has built up in the Arctic Ocean over the past few seasons. That being the case, it is almost a certainty that you have not been looking at how all that anomalous heat is interacting with the atmosphere and affecting things such as wind and weather patterns and the polar vortex. No problem. Pull up a chair and spend a few minutes on this important topic and you’ll be up to speed. Or at least, closer to being up to speed. If you want to track the air and ocean surface temperatures for various regions of the world on a daily basis, you can do so at a site called climate reanalyzer. The site is maintained by the University of Maine and it turns constant data into graphics that are easy to understand. The site also has fantastic weather predictions and other trend tracking rendered into visual data. The illustrations below are from the site. The Arctic Ocean has become a heat sink that is absorbing heat from the atmosphere (and the air in the arctic has been very, very anomalously warm – up to 30F degrees warmer than normal) and from the sun. 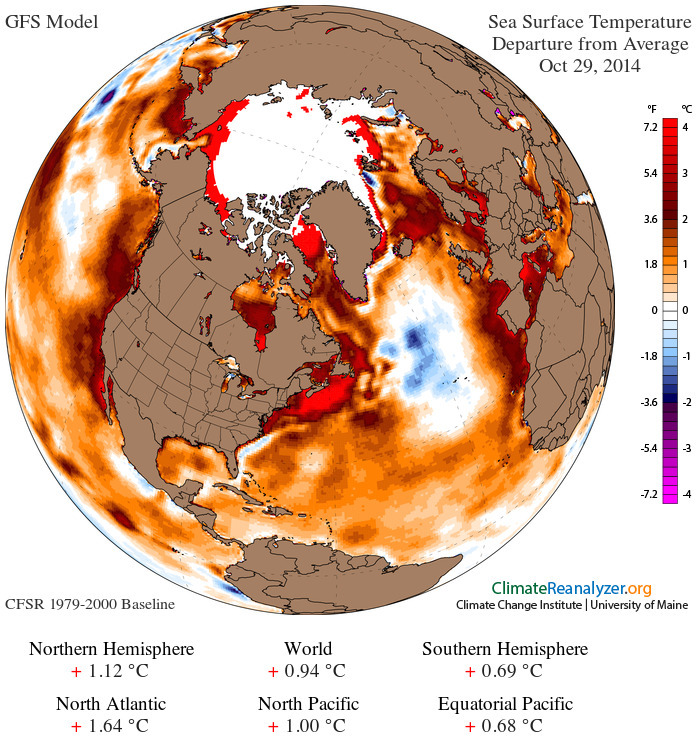 And, with the warmer-than-normal water insulated for the winter under a blanket of ice, the ocean will start off next spring already warmer than normal. You might expect that all of this heat in the Arctic Ocean would eventually melt some of the polar ice cap, and you’d be right. It has been melting the polar ice cap for decades. 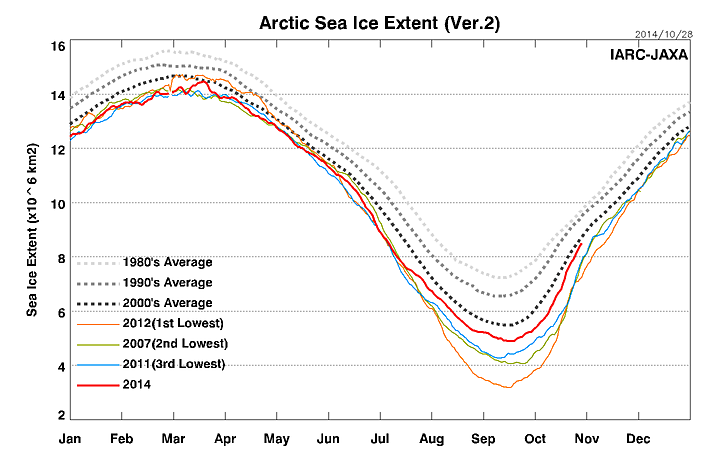 You can see the steady loss of ice extent (the area of the ocean covered by ice) in the graph below. The trend is very, very clear. 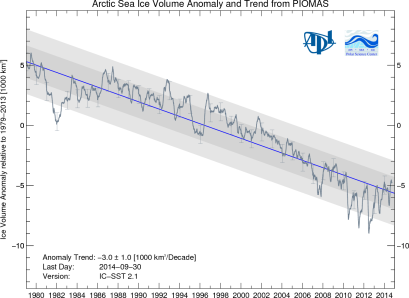 And that trend is worrying because less ice volume means that the Arctic Ocean is more interactive with the atmosphere for longer periods each year, which in turn means that our jet stream and storm systems (and polar vortex) are less and less stable. The loss of ice in the arctic, we are finding, seems to be linked to everything from extreme storms in the Midwestern US to the drought in California and the west. And, if the above graphs are pointing us in the right direction, we can expect more and more instability in weather and storm systems which will, in turn, affect agriculture, transportation, health, property values, business costs, etc., etc. It just keeps coming and coming and next years problems are currently sleeping out the winter, biding their time, under and ever-thinning layer of ice.